While researching family history during the last three years this photograph became available. It shows eight young members of the Dibdin family who obviously knew each other, with William Joseph Dibdin, the Patriarch of the family and father of three of them. 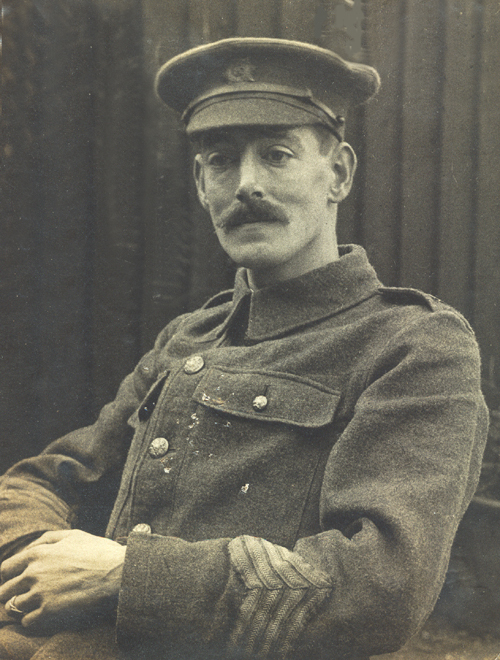 These were all willing participants, each for their own reasons, in the First World War. Further investigation have turned up a total of at least 19 close members of the families that include the Dibdin, Haycraft, Davis, and Rowntree families. 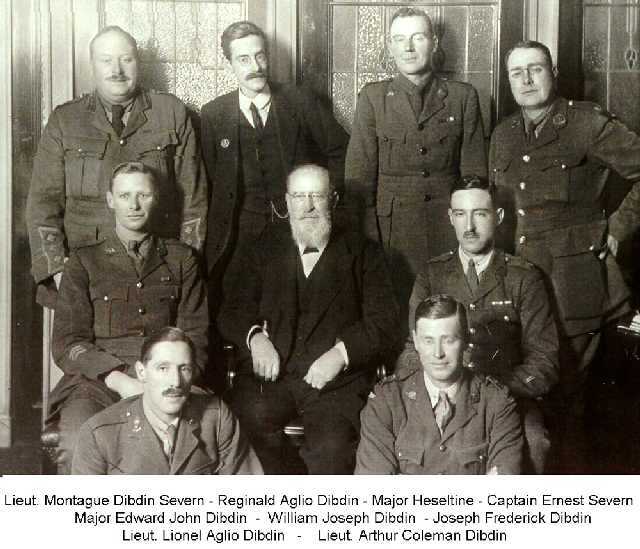 Reginald Dibdin, was I think, sensitive young man who must have been devastated not only be the injuries he sustained but also by what he saw on the front. It cost him his sanity for many years and probably what would have been a successful scientific career. Of this number known 5 died, several were injured and, or gassed and in contrast to the willing attitude among them at the beginning of the war, the adjacent photograph show the signs of torment, grief and pain experience by many. Another 11 names are now counted among those that were active in the Second World War and of those 3 died on active service. 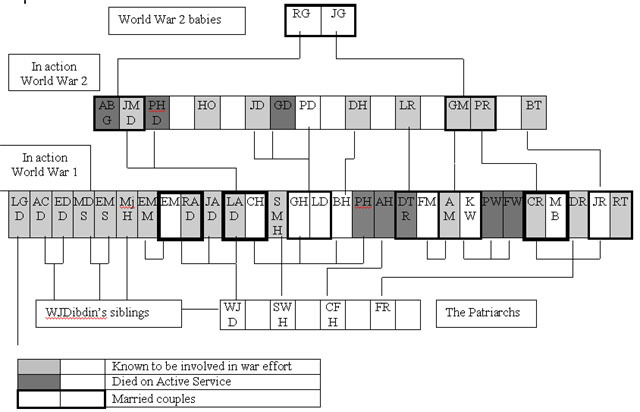 In trying to grasp the significance and impact on the sacrifice made by previous generations, it may help to look at the relationships in diagrammatic family tree terms. Family trees usually start at the top with a few individuals some time in the past and as one descends down through the generations the tree spreads out, visually like roots of a tree or rather like branches if one turns the tree upside down. Collating and amalgamating the information and war stories of so many ancestors, it feels as if one is standing on top of a pyramid of individuals with an ever widening base as one draws in more family connections. Of course, the issue is more complex than that and no doubt the information will expand. It will be seen that the greatest detail has been devoted to Lionel Dibdin and his nearest family and Colin Rowntree. The explanation for this is that both are the grandfathers of RG and JR and so there is available a considerable amount primary source material in the form of documents, letters and books, enabling the stories to be pieced together. It is hoped that anyone, reading this article, who recognises errors in the narrative will in the first instance forgive the errors or omissions and then pass on any further information, so that the truth can be recorded and made available to future generations.